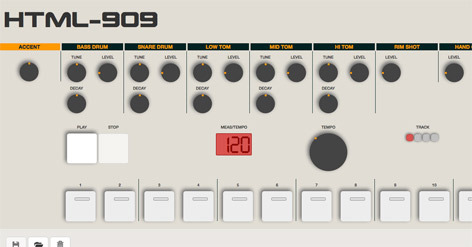 Check out the super cool HTML-909 programmed by Teemu Kallio. This emulation of the Roland TR-909 drum machine made with HTML5 allows any user the ability to create their own analog drum patterns by simply visiting the website on the internet and you can play right from your browser. Earlier this year we saw the HTML Drum Machine that mimicked the TR-808 and also an in-browser TB-303 with the Acid Machine. The TR-909 drum machine is a classic piece of hardware that has appeared in countless tracks in numerous genres. It’s one of the most recognized drum machines to ever built and critical to all genres of dance music. Have your fun with the HTML-909 where you can also load and save projects. Make something cool and share it with the group!